What treasures do you keep in your heart? This antique carved netsuke pendant symbolizes your secrets and dreams � love, hope, inspiration, empowerment � protected in a spiritual pouch... only you know what's inside. 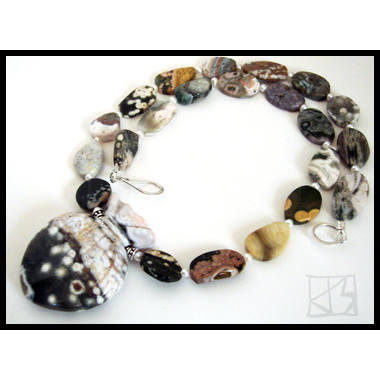 What the rest of us see is Madagascar Ocean Jasper, a gorgeous orbicular stone prized for its intricacies and wide color palette. 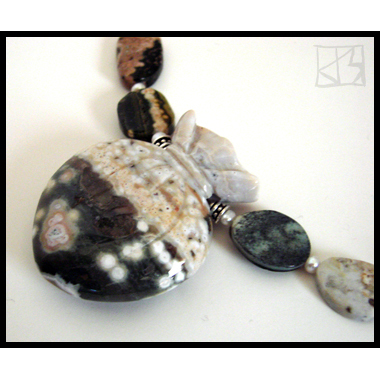 Handpicked oval nuggets, also top-grade Ocean Jasper individually shaped by hand, highlight the wide range of colors in the pendant and are separated by small freshwater pearls. The carved stone netsuke (42mm x 32mm x 12mm) comes from vintage stock... I understand there are only a small number around besides the handful I have. 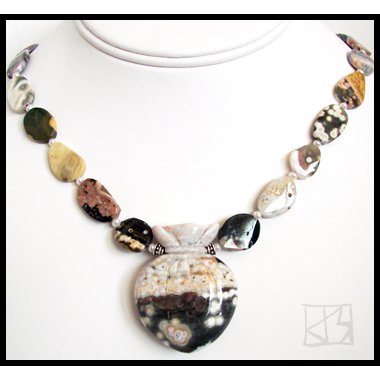 As no two are alike, I am having fabulous fun creating extraordinary pieces from each one. Protect your heart's treasures while keeping them in plain sight... or in this case, beautiful sight!